Spray Nozzle Engineering, one of Australia’s largest supplier of in place cleaning and water saving equipment, offers Lafferty Foaming and Sanitising Equipment. 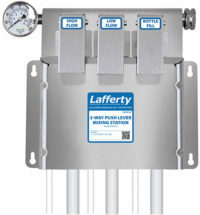 Lafferty equipment includes: Foamers, sanitisers, sprayers, mixing (proportioning) stations, foggers, asphalt release systems and systems to control cross contamination. Lafferty products are available in configurations to match your requirements, including a wide range of pressures and volumes. Most products are available in both portable and wall mount models. Food and Beverage Specialist Stuart Morgan explains: “ Lafferty is a specialist manufacturer of cleaning chemical mixing and delivery equipment. They have both fixed and portable systems for not only foaming a workplace, but also sanitising and rinsing” he said. “The beauty of the Lafferty system is both simplicity and rugged build quality, using poly prop mixing bodies means better chemical resistance and less maintenance, and with the added ability to meter chemical use, you can clean with less water and less chemical on many applications. We have high volume foamers for big areas and entryway sanitisers for high traffic area protection like roller doors”. 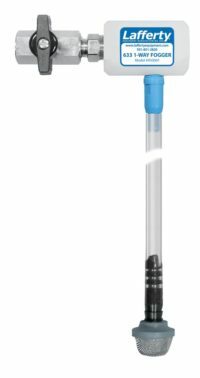 Foam nozzles from Lafferty make easy work of cleaning large surfaces. 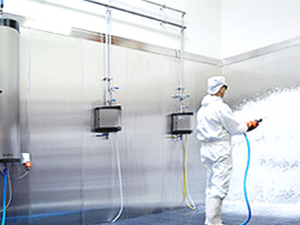 Using foam nozzles to clean industrial equipment saves time, resources, and effort. 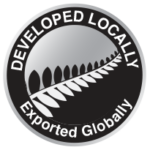 Spray Nozzle Engineering has been designing and distributing foam nozzles to New Zealand industries for over 30 years. Spreading foam insulation in the construction industry. You pay attention to the temperature of the material being sprayed–too hot or too cold will produce less than desirable results. They are clear of debris. Keeping your foam nozzles clean ensures they will last longer. You spray slowly for maximum coverage. At Spray Nozzle Engineering, we have been in the business of designing spray nozzles for over 30 years. Our commitment to delivering effective products ensures our customers receive time-saving solutions for their industry. Our foam nozzles produce maximum results for our customers across multiple industries. Spray Nozzle Engineering supplies our customers with the appropriate foam nozzle for use with foam cleaning solvents. Contact our knowledgeable staff for assistance with purchasing foam nozzle replacements for your equipment.